This document is intended to demonstrate these features. To do so, we first need to define some domain objects that we’ll be using. As you can see, this is really simple code. A Product has two scalar properties (name and price), a OneToOne relationship (one product has one brand), and a OneToMany relationship (one product has many categories). The first step is to create three fieldsets. Each fieldset will contain all the fields and relationships for a specific entity. We can discover some new things here. As you can see, the fieldset calls the method setHydrator(), giving it a ClassMethods hydrator, and the setObject() method, giving it an empty instance of a concrete Brand object. When the data will be validated, the Form will automatically iterate through all the field sets it contains, and automatically populate the sub-objects, in order to return a complete entity. 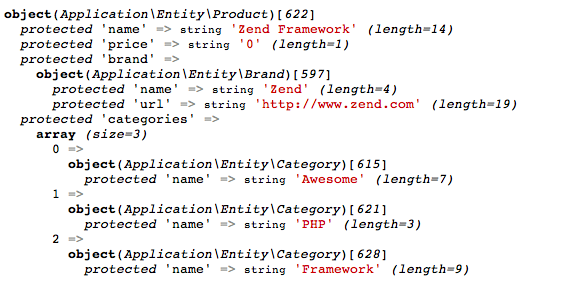 Also notice that the Url element has a type of Zend\Form\Element\Url. This information will be used to validate the input field. You don’t need to manually add filters or validators for this input as that element provides a reasonable input specification. Finally, getInputFilterSpecification() gives the specification for the remaining input (“name”), indicating that this input is required. Note that required in the array “attributes” (when elements are added) is only meant to add the “required” attribute to the form markup (and therefore has semantic meaning only). We have a lot of new things here! First, notice how the brand element is added: we specify it to be of type Application\Form\BrandFieldset. This is how you handle a OneToOne relationship. When the form is validated, the BrandFieldset will first be populated, and will return a Brand entity (as we have specified a ClassMethods hydrator, and bound the fieldset to a Brand entity using the setObject() method). 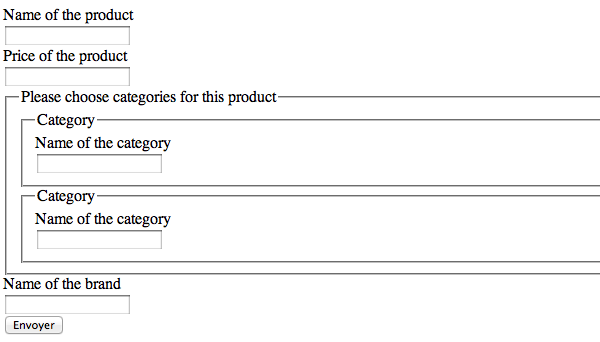 This Brand entity will then be used to populate the Product entity by calling the setBrand() method. The next element shows you how to handle OneToMany relationship. The type is Zend\Form\Element\Collection, which is a specialized element to handle such cases. As you can see, the name of the element (“categories”) perfectly matches the name of the property in the Product entity. count: this is how many times the element (in this case a category) has to be rendered. We’ve set it to two in this examples. should_create_template: if set to true, it will generate a template markup in a <span> element, in order to simplify adding new element on the fly (we will speak about this one later). allow_add: if set to true (which is the default), dynamically added elements will be retrieved and validated; otherwise, they will be completely ignored. This, of course, depends on what you want to do. target_element: this is either an element or, as this is the case in this example, an array that describes the element or fieldset that will be used in the collection. In this case, the target_element is a Category fieldset. CreateProduct is quite simple, as it only defines a Product fieldset, as well as some other useful fields (CSRF for security, and a Submit button). Notice the use_as_base_fieldset option. This option is here to say to the form: “hey, the object I bind to you is, in fact, bound to the fieldset that is the base fieldset.” This will be to true most of the times. What’s cool with this approach is that each entity can have its own Fieldset and can be reused. You describe the elements, the filters, and validators for each entity only once, and the concrete Form instance will only compose those fieldsets. You no longer have to add the “username” input to every form that deals with users! This is super easy. Nothing to do in the controllers. All the magic is done behind the scene. the prepare() method. You must call it prior to rendering anything in the view (this function is only meant to be called in views, not in controllers). the FormRow helper renders a label (if present), the input itself, and errors. the FormCollection helper will iterate through every element in the collection, and render every element with the FormRow helper (you may specify an alternate helper if desired, using the setElementHelper() method on that FormCollection helper instance). If you need more control about the way you render your forms, you can iterate through the elements in the collection, and render them manually one by one. As you can see, collections are wrapped inside a fieldset, and every item in the collection is itself wrapped in the fieldset. In fact, the Collection element uses label for each item in the collection, while the label of the Collection element itself is used as the legend of the fieldset. You must have a label on every element in order to use this feature. If you don’t want the fieldset created, but just the elements within it, simply add a boolean false as the second parameter of the FormCollection view helper. As you can see, the bound object is completely filled, not with arrays, but with objects! Remember the should_create_template? We are going to use it now. As you can see, the collection generates two fieldsets (the two categories) plus a span with a data-template attribute that contains the full HTML code to copy to create a new element in the collection. Of course __index__ (this is the placeholder generated) has to be changed to a valid value. Currently, we have 2 elements (categories and categories, so __index__ has to be changed to 2. First, count the number of elements we already have. Get the template from the span’s data-template attribute. Change the placeholder to a valid index. Add the element to the DOM. One small remark about the template.replace: the example uses currentCount and not currentCount + 1, as the indices are zero-based (so, if we have two elements in the collection, the third one will have the index 2). Although you can add new elements and remove them, you CANNOT remove more elements in a collection than the initial count (for instance, if your code specifies count == 2, you will be able to add a third one and remove it, but you won’t be able to remove any others. If the initial count is 2, you must have at least two elements. Dynamically added elements have to be added at the end of the collection. They can be added anywhere (these elements will still be validated and inserted into the entity), but if the validation fails, this newly added element will be automatically be replaced at the end of the collection. Validation groups allow you to validate a subset of fields. The URL input has disappeared, but even if we fill every input, the form won’t validate. In fact, this is normal. We specified in the input filter that the URL is a required field, so if the form does not have it, it won’t validate, even though we didn’t add it to the view! Of course, you could create a BrandFieldsetWithoutURL fieldset, but of course this is not recommended, as a lot of code will be duplicated. Of course, don’t forget to add the CSRF element, as we want it to be validated too (but notice that I didn’t write the submit element, as we don’t care about it). You can recursively select the elements you want. There is one simple limitation currently: validation groups for collections are set on a per-collection basis, not per-element in a collection basis. This means you cannot say, “validate the name input for the first element of the categories collection, but don’t validate it for the second one.” But, honestly, this is really an edge-case. Now, the form validates (and the URL is set to null as we didn’t specify it). Go to Form Collections on GitHub.